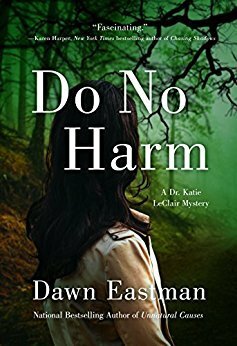 DO NO HARM by DAWN EASTMAN – Books, Books and More Books! Small-town doctor Katie LeClair is drawn back into an old murder investigation, a mysterious disappearance, and a dark undercurrent of violence. Dr. Katie is back in this second of the series. Katie is loving her new job and house, not to mention a maybe new love. It’s Halloween in the small town of Baxter, Michigan and Katie has just met Eugene, recently released from prison for a murder he says he did not commit. But as the town readies itself for their Halloween Festival, her patient goes missing and a college student who was looking into Katie’s old murder case is found dead. Again, Katie trades in her doctors coat for her sleuth hat and tries to find the truth while staying alive. I have to say I was a bit confused. The blurb stated this was for fans of Ellison and Gerritsen. It was not. As a fan of both I would say this was more of a cozy mystery than thriller. That being said it was enjoyable and easily stood alone if you haven’t read the first one. Katie is a very interesting character. I LIKE THOSE COZY MYSTERIES! You won the cozy mystery. Congratulations!